Clare Barton. From The Red Cross in Peace and War, 1899. Click to enlarge. Barton (1821–1912) was doing what she did best: ministering in the midst of catastrophe, bringing aid and comfort, “always going where suffering humanity most needed her.”2 The list of her engagements is a roll call of later 19th-century history. In addition to Cuba (1898) were the battles of Second Bull Run and Antietam (1862), the Franco-Prussian War (1870–1871), the Johnstown Flood (1889), Russian famine relief (1892), the Armenian massacres (1895–1896), and the Galveston hurricane (1900), among others. What better time to remember her achievements than Women’s History Month and Red Cross Month? During her extended stay in Europe from 1869–1873, she became acquainted with the Red Cross movement, which she brought back to the United States and formalized with a charter for the American Red Cross in 1881. Yet although she headed this organization until 1904, she remained in the field from her early 40s until she was almost 80. 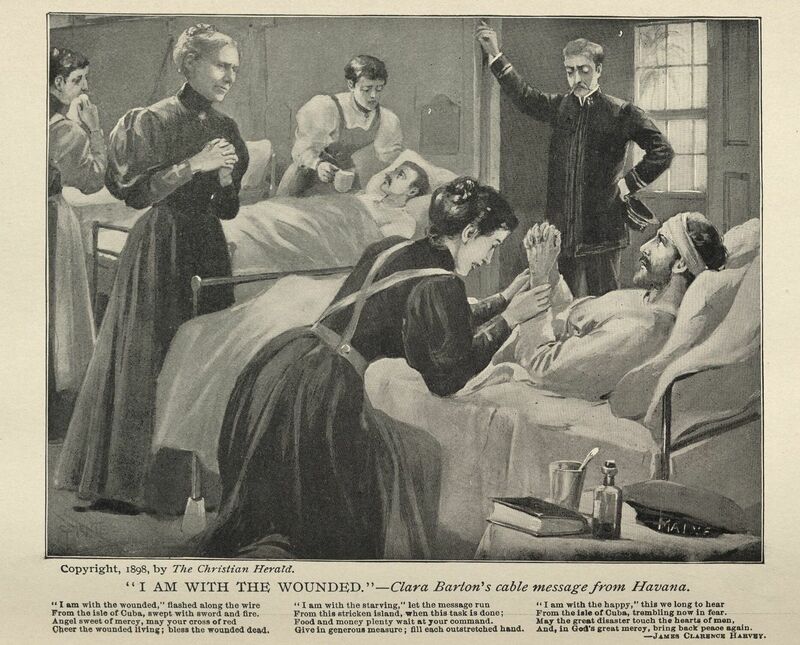 “I am with the wounded.” Originally printed in The Christian Herald and reprinted in The Red Cross in Peace and War. Click to enlarge. Though she was devoted to impartially aiding human suffering, Barton’s efforts in Cuba got swept into the maelstrom of politics. Spanish authorities resisted her investigations, and her reports of the reconcentrados’ suffering helped push the United States into war. Her relief efforts were then caught up by that war: back from Cuba by March, she tried to return on April 25 with relief supplies, but war had been declared two days before. Her ship, the State of Texas, was held at Tampa; providing food and medicine to Cuba was the last thing that the belligerent American government now wanted. 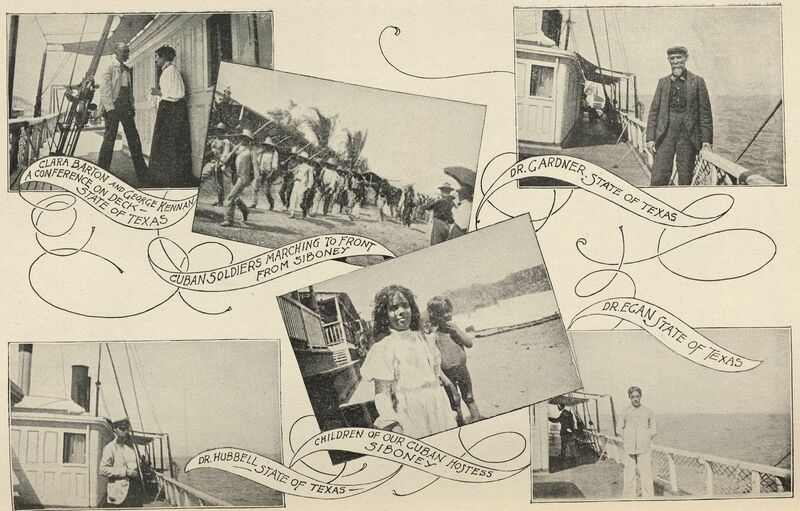 A photomontage of Barton’s return to Cuba and time on the ship the State of Texas. From The Red Cross in Peace and War. Click to enlarge. 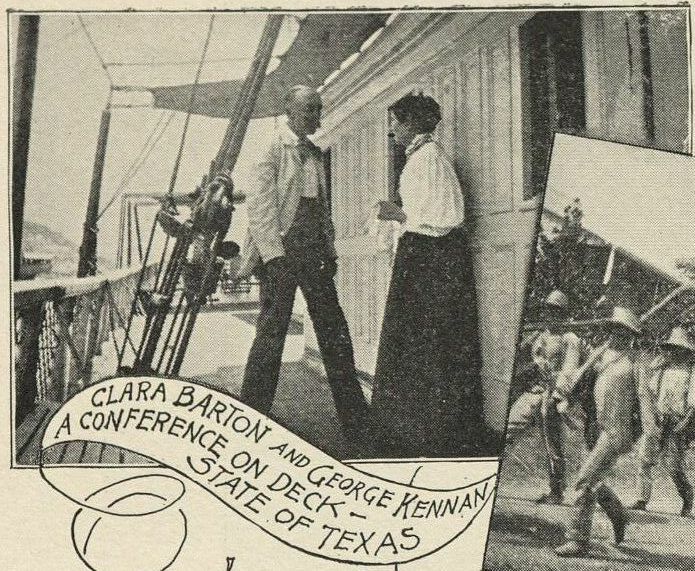 Barton with Keenan, a close-up from the State of Texas photomontage. Click to enlarge. 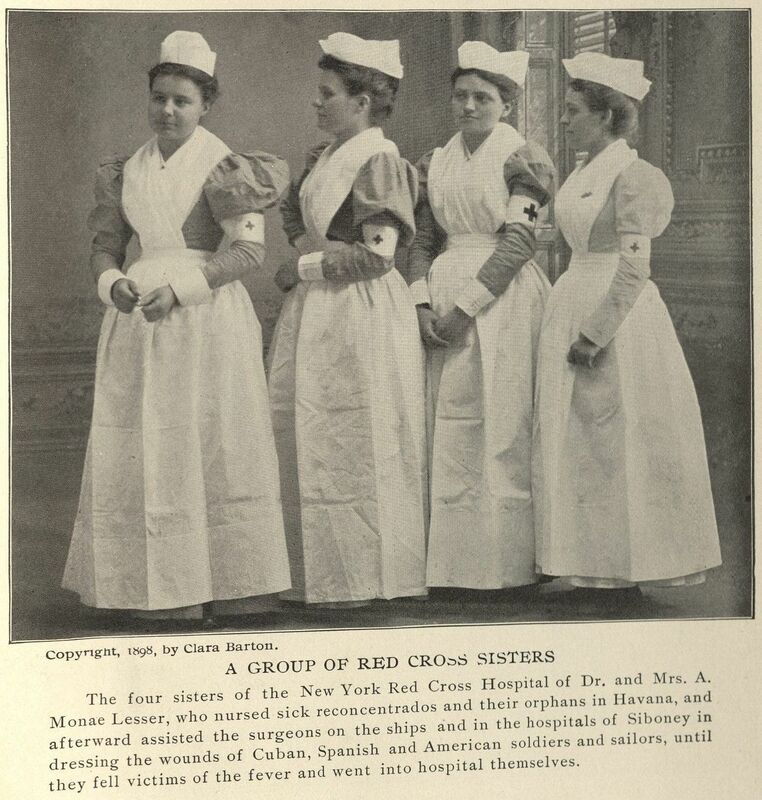 “A group of Red Cross sisters.” Photo taken by Barton and published in The Red Cross in Peace and War. Click to enlarge. What did they go for? Just to be in the way! They would scream at the sight of a gun, don’t you see? And write us some letters, and tell us the news. There to patiently wait until victory comes. And they went,—where did they go?—Ah! where did they not? What was women’s role in battle? The women of question; what did they go for? And the armor of right broke the barriers through. And that was the “running” the men saw them do. That is, women ran into battle, not away! And what would they do if war came again? The scarlet cross floats where all was blank then. Hers was a noble vision, founded on the battlefields of Bull Run and Antietam. Barton found a nursing and consoling role for women at those battlefields. She also found a logistical role for women in relief organizations, but for her, the presence of women in battle—her own presence in battle—remained defining. That presence was contentious in her time; today, the debate continues over whether to draw the line between men’s and women’s roles in battle. Yet one wonders, with Barton, whether the issue of women’s courage lies at the bottom of this debate. 1. Barton, C. (1899). The Red Cross in peace and war. Washington, D.C.: American Historical Press. Retrieved from https://archive.org/details/cu31924074466842. 2. Pryor, E. B. (1987). Clara Barton: Professional angel. Philadelphia: University of Pennsylvania Press. 3. U.S. National Park Service. (n.d.). The Women Who Went to the Field – Clara Barton National Historic Site (U.S. National Park Service). Retrieved March 11, 2014, from http://www.nps.gov/clba/historyculture/fieldpoem.htm. 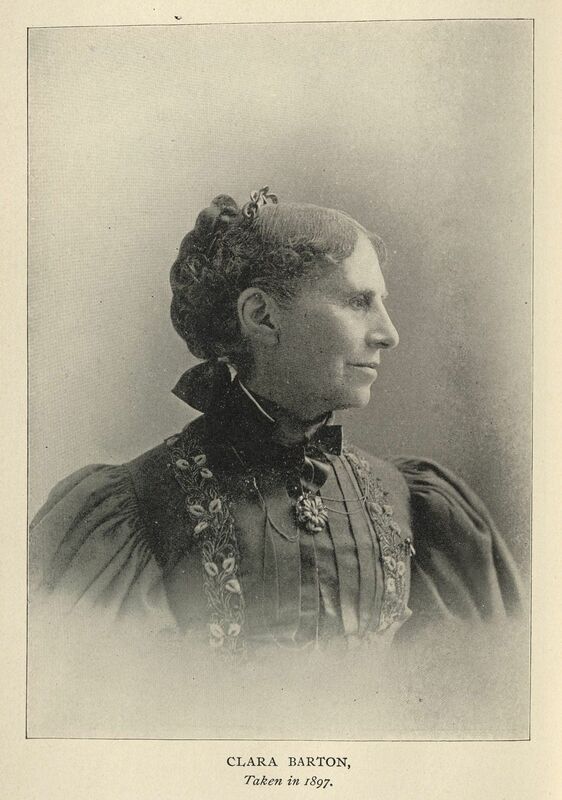 This entry was posted in Collections, History of medicine and tagged American Red Cross, Clara Barton, Cuba, Red Cross Month, Spanish-American War, Women's History Month by nyamhistorymed. Bookmark the permalink.